Has anyone been following this? There are 20 something candidates! It would be great to share any info here if someone has any. There was a forum on NY1 last night. But, it seemed a bit chaotic from the clips I watched. 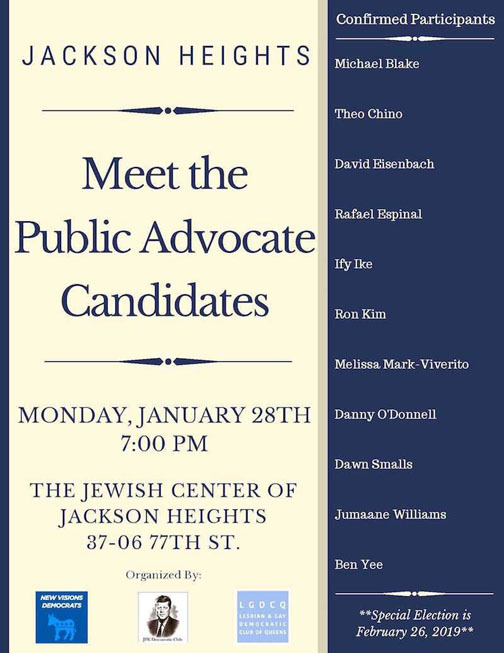 Here's info on a forum scheduled for next week at the Jackson Heights Jewish Center. To date, I'm not sure if the list of attendees is complete, given the number of candidates. But as that story points out, very few people will vote in this election, so it is sort of anyone's game. Just a reminder this is happening today! The Gotham Gazette has some last minute voter guides if you're not sure who to vote for. And if you have more time, they also did 15 minute interviews with each candidate. and we have a temp in the job. Jumaane Williams. Indeed. Although he won by such a huge margin Dems may be reluctant to challenge him in the December primary. According to this map, Melissa Mark Viverito took the most votes in AD34. she definitely had the most leafletters and canvassers. eric ulrich's robocalls were the most numerous -- one a day for the last two weeks -- and the funniest, focusing on "the socialist menace" and its danger to me, the real american. different spoofed number, same recorded message each time. I received one call, which I took and explained who I would be voting for, and numerous texts (the first two of which I responded "no" to) from only one candidate: Raphael Espinal. interesting. i had about five mailings each from Ms. Mark-Viverito and Mr. Yee, and several under-the-door cards from her campaign. nothing from anyone else, and calls only from the Ulrich folks. As an earlier poster noted, he won by a wide enough margin that he seems to be a near-lock in the general.